When Lou Reed embarked toward his first solo album, he approached Andy Warhol out of lack of inspiration. “I don’t know what to write about,” Reed complained. Warhol distractedly responded, “Just write about…’Vicious…You hit me with a flower’”…a combination of imagery that exemplified Warhol’s polarized ideals, now one of the most distinguishable opening lines of any rock album. Warhol possessed the sort of mind that could spontaneously create. The notion of the art studio as a factory was a stab at the commodification of art. But it was also an endeavor to not only increase the output of product, but to beautify its generative process through a social sphere encompassing extremes of anomaly and beauty. Though fascinated with the world of appearances and social status, Warhol’s sensibilities seemed detached on the one hand, and indiscriminately awed on the other. He worshipped the constructs of high society and celebrity, but he equally esteemed scum and the subversion of social ideals and accepted tastes. 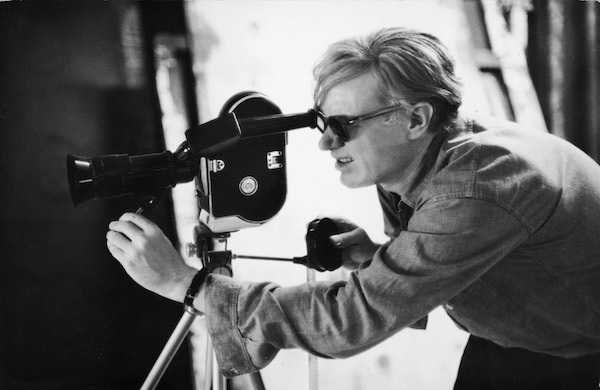 Andy Warhol’s work in film was prolific and multi-faceted. One of its chief qualities is a voyeuristic gaze into the behavior – both ludicrous and mundane – of those whom he admired as stars in a firmament of his own creation. The Cinema’s re-inaugural series credits the artist’s innovative vision with Reel 2 of Warhol’s Screen Tests. These intimate cinematic portraits are one Warhol’s most celebrated contributions – a testament to his vanguard eye and also his charisma – that commanded a candid and penetrating depiction of his subjects. The films were made between 1964 and 1966 and portray an eclectic array of Warhol associates such as Salvador Dali, Allen Ginsburg, Marcel Duchamp, Nico, Yoko Ono, and Paul Theck. They number in the 500’s ranging from the rich and famous to the urchins and hustlers in whom Warhol could detect the makings of a star. The series pairs the Screen Tests with Lonesome Cowboys, a collaboration with regular cohort Paul Morrissey that parodies Hollywood Westerns, starring Factory superstar Viva as the mistress of a ghost town and Taylor Meade as her nurse – repeatedly ravished by a quintet of horny athletic cowboys. The film is an irreverent and loose interpretation of Romeo and Juliet, tinged with raucous immaturity and homoeroticism. Its comedic dialogue and trashy self-indulgence are signature to Warhol’s firmer re-interpretations of gothic classics such as Dracula and Frankenstein. Another feature is the comedic Tarzan and Jane Regained…Sort Of. In the mere title Warhol is able to invoke Proust, Hollywood iconography, sexual innuendo, and self-referential criticism. The film again stars Factory favorite Taylor Mead as a vague interpretation of the King of the Apes on a road trip to Los Angeles. Actress Naomi Levine co-stars as Jane, and Dennis Hopper makes an appearance as a Tarzan stand-in when Mead lacks the agility (or sobriety) required to climb a tree and fetch a coconut. The Velvet Underground Tarot is one of the series’ rarest acquisitions in which the eponymous band have their tarot cards read by a psychic at a party; the endeavor laden with lavish and inebriated distractions of the Factory Party atmosphere.